Jachtwerf Heeg introduces the new Splash line and corporate identity. The Splash, a major international racing class for more than 25 years already, has a new logo and 2 siblings. In collaboration with designer Koos de Ridder, the Splash is now available with 3 different sails on the same boat; GREEN, BLUE en RED. A new Splash line and logo! 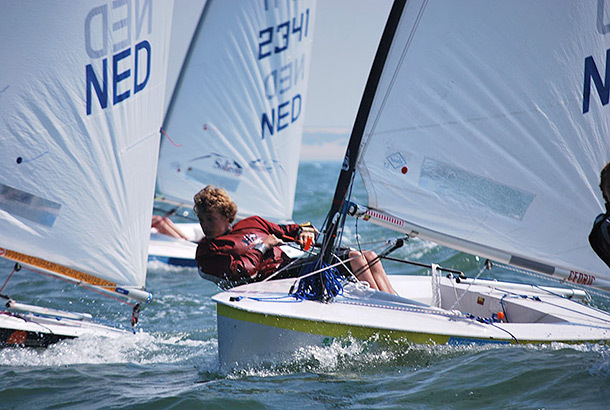 The new Splash has been designed especially for young sailors, aged 13 to 19. The Splash is not just fast, but also easy to handle. A winning concept for over 25 years! This modern racing and recreational sailboat fits the body of young sailor like a glove. The Splash doesn't sail spectacularly just because a Force-3 wind already gets it planing, but also boasts great trimming options. The most eye-catching is the SPLASH RED which -with its new big fathead laminated sail- will replace the Flash class. Completing the Splash line is the SPLASH GREEN. It has a smaller sail for very young sailors and training purposes.